Lets have a cocktail...: A real downward facing dog? What might this be, you ask. Do you see the yoga mat? And the gentle stretching of the dog's limb? Yes, you are seeing correctly. This is doggie yoga. Traditionally, a physical and mental discipline enjoyed by millions of people, I can not assert I was even aware canines enjoyed the practice as well. Oh wait, I am not sure if that little face above shows a tranquility and etherealness. And while this dog may just be in a zen space, I would wager that a stroll at the park or perhaps a doggie ice cream would produce a purer sense (and demonstration )of joy. This little face seems to ask, "ummm, what did I do?" While it may be the truest form of downward facing dog, I have to applaud this doggie for even tolerating it. I wonder if a dog has such stress that doggie yoga is an actual and possible relief? I tried a doggie yoga pose on Nixon once, and let's just say, I am lucky I didn't wake up to a puddle in my slipper. There were numerous other dogs in this class too. Including some taking a big snooze. Peaceful canine chakra? Love it. 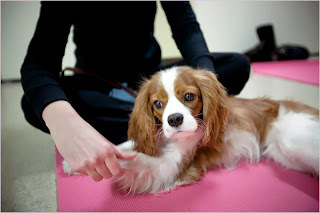 Getting your "doggie yoga" certification? Who knew such a career existed. And if it works to bring peace and harmonious hearts to man's best friend, there are a few yappers in my neighborhood that should start immediately. Too funny. What's next?? Doggy meditation? Next up is doggie pilates. Poor sweet dogs.